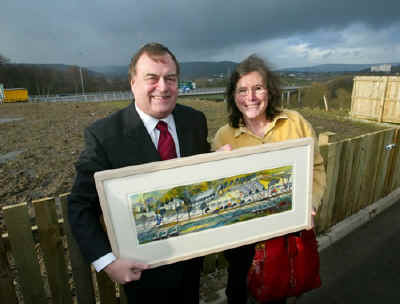 When the Bingley Relief Road was opened by John Prescott, one of my Janescapes was chosen to be presented to the people of Bingley to mark the occasion. For as long as I can remember I have always painted. I just love paint. If a day passes without painting I feel quite saddened and deprived. Until quite recently I have never really had a particular style, subject matter or medium. I never drew outlines. It was almost a rule I had set myself. Then in the spring of 2000 as a result of a dream I started to outline the buildings from this dream, using drawing pen and some wonderful watercolour paper I had acquired. As soon as I had drawn it I felt a need to paint. I found it a fascinating and refreshing way to work, and painting after painting followed in this style. Wherever I went I saw beautiful urban landscapes before me. This area is so rich in wonderfully laid out patterns all just waiting to be captured. My eyes constantly search for repeating patterns that can span the pages. It was not long before I was enticed by the rows and rows of bollards that were arriving in Bingley in preparation for the long awaited relief road. It was heaven. The red and white cones brought life to the grey buildings around Bingley and they began appearing in my work. A particular style was developing. It was hard describing the "quirky urban landscapes", "strange townscapes" etc and they became christened by my husband "Janescapes". The first relief road painting of bollards, terraces and washing I named "Make way for the bypass". Since then, many have followed. They have been a great joy to paint. "Every morning I am awoken by the bong bong bong of the pile drivers working on the Bingley Relief Road. Suddenly the noise stops, the air is still, everything is silent. You wait with bated breath for something to happen. It reminds me of the old westerns when the drumming stopped & the Indians attacked." On a bright day, I can look across the never ending rows of terraces with their chimneys casting black shadows, echoed by the vast mill chimneys, contrasted by rows of billowing washing, bright bollards and American tan stockings, and think it is the most beautiful place in the world. I feel so lucky and honoured to have one of my paintings displayed in the library. Thank you everybody.